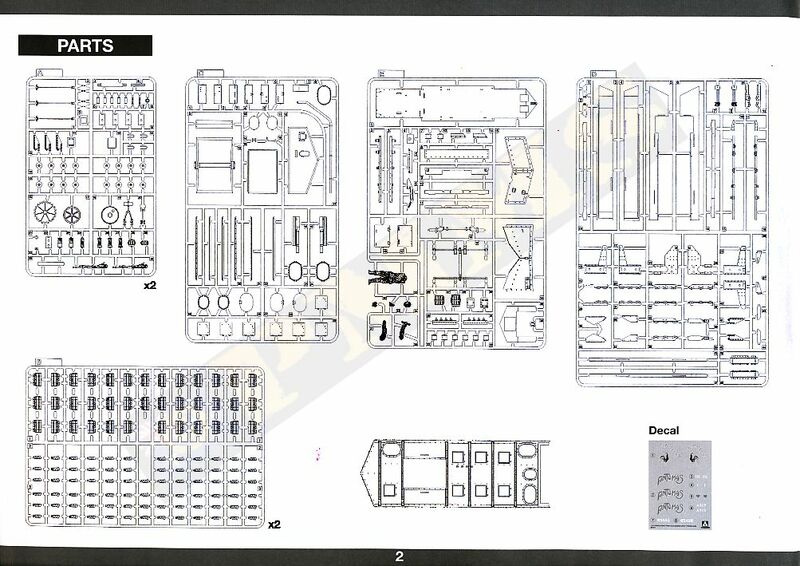 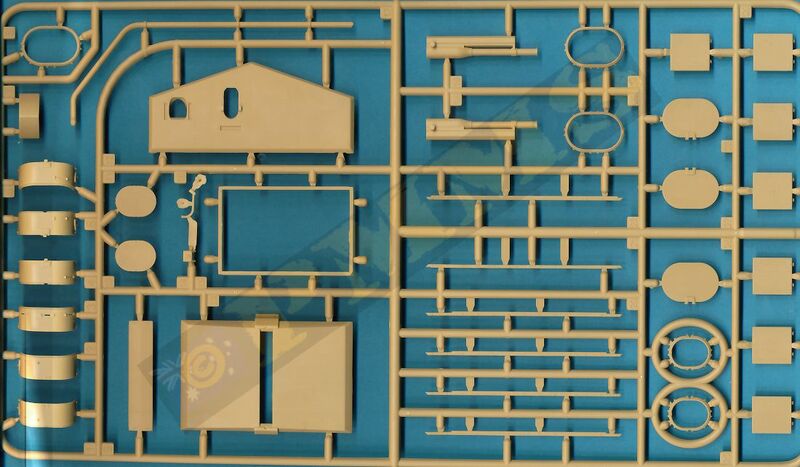 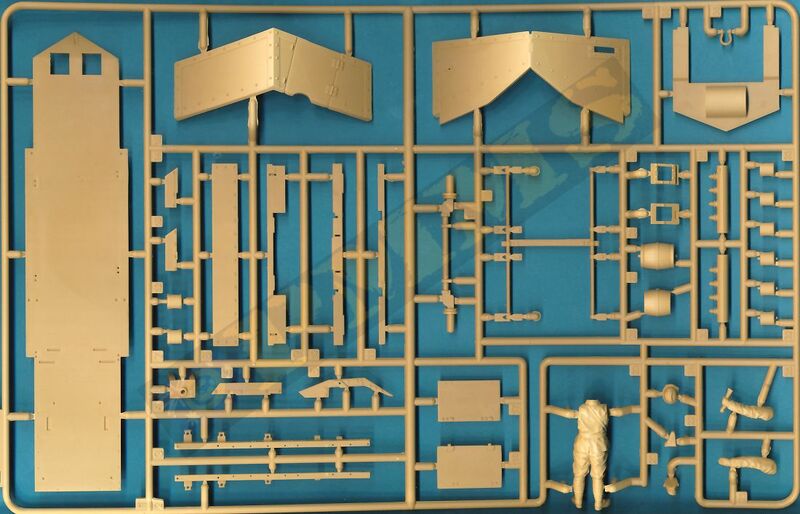 This new 1:35 kit from Takom is labelled “Early Type” as there were four distinct production types of the St.Chamond during its production run. 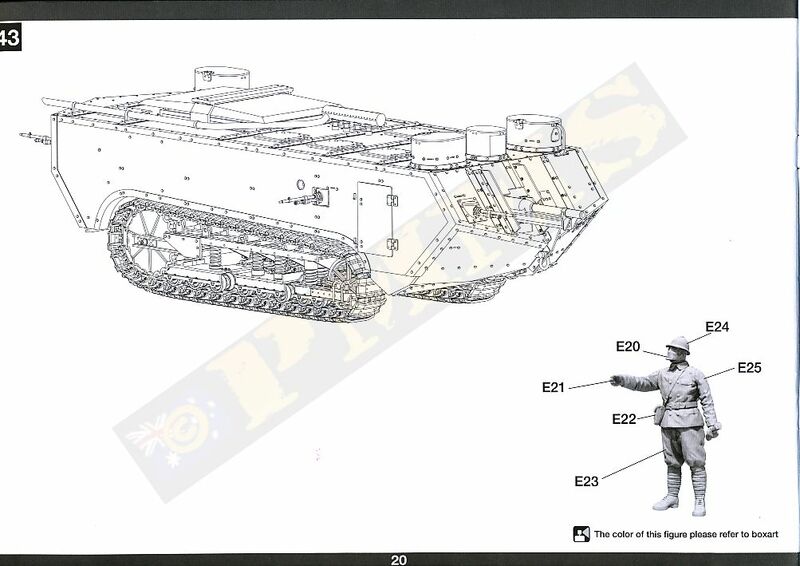 This kit actually represents the second production version of the St.Chamond which featured the flat roof with third central forward roof turret (the first production type only had the two outer turrets) and could be called “early” as the latter two types with angled roof followed this version. 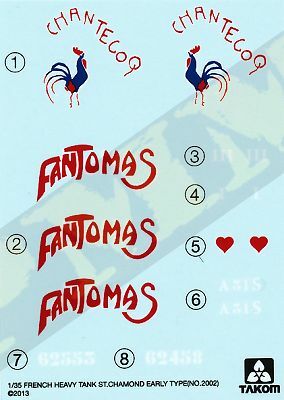 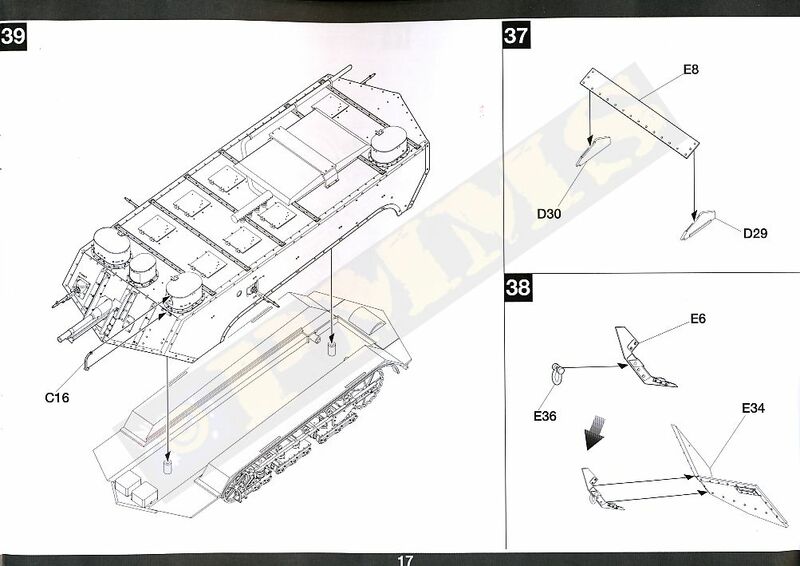 Another point of note is the early versions used 326mm wide track, later increased to 412mm and finally to 500mm wide but this doesn’t seem to correspond with the production types as period photos of the two marking options in the kit “Chantecoq” and “Fantomas” of AS31 both show them to be the second production version but with the later 500mm wide track that is included in the kit. 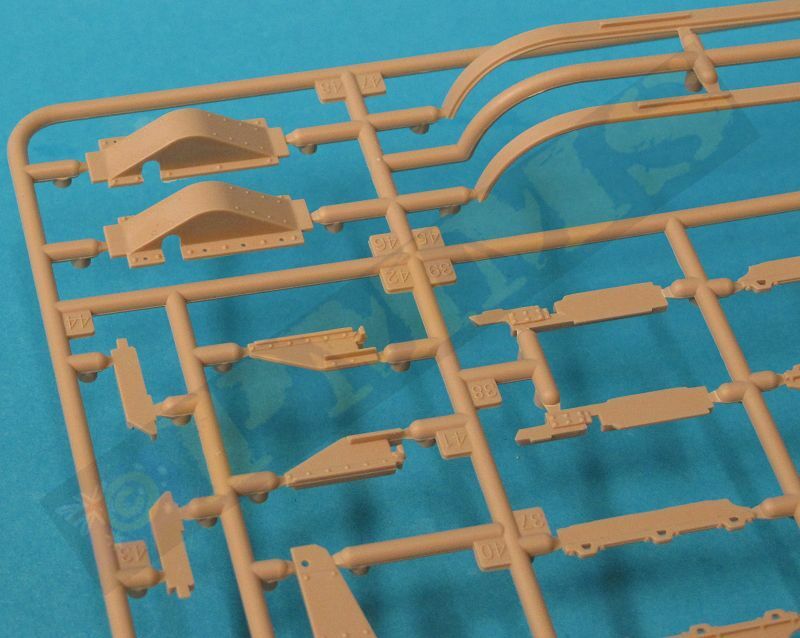 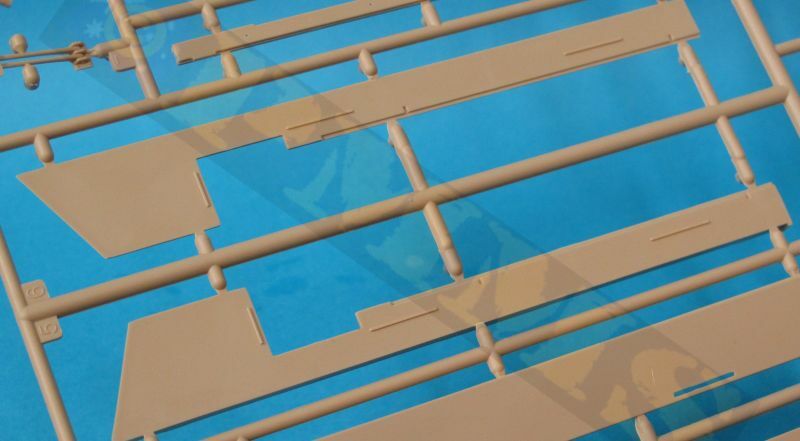 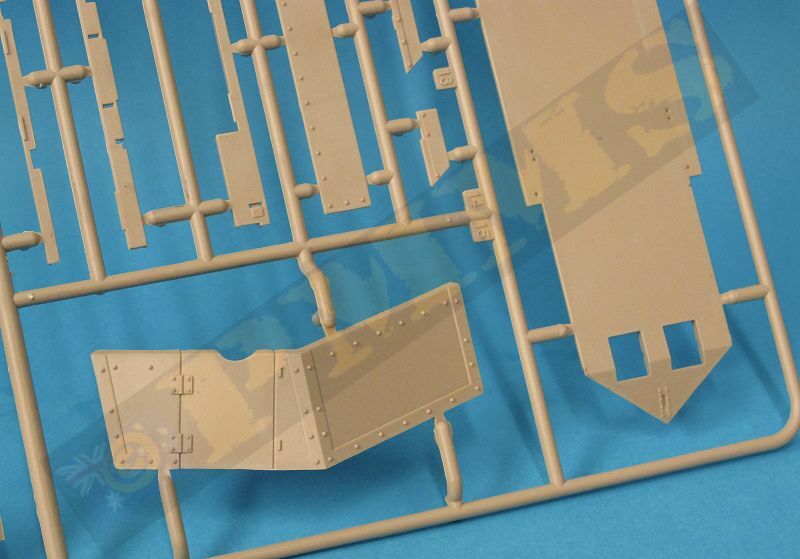 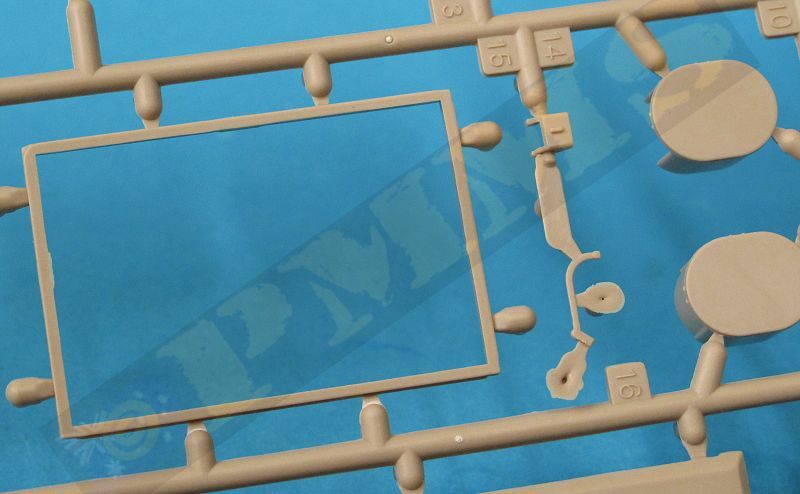 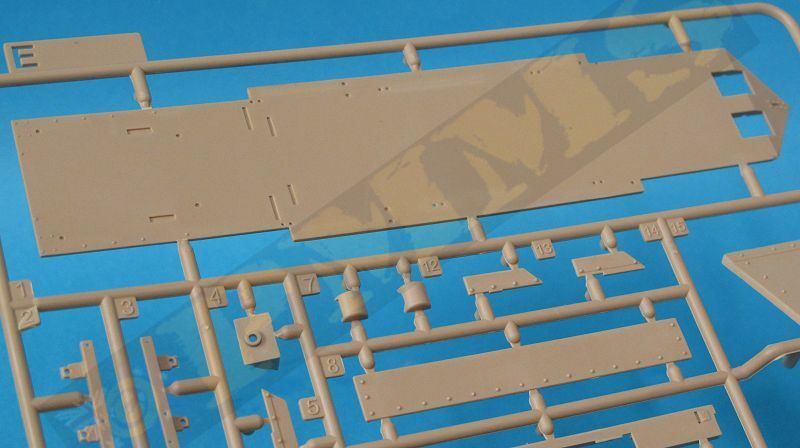 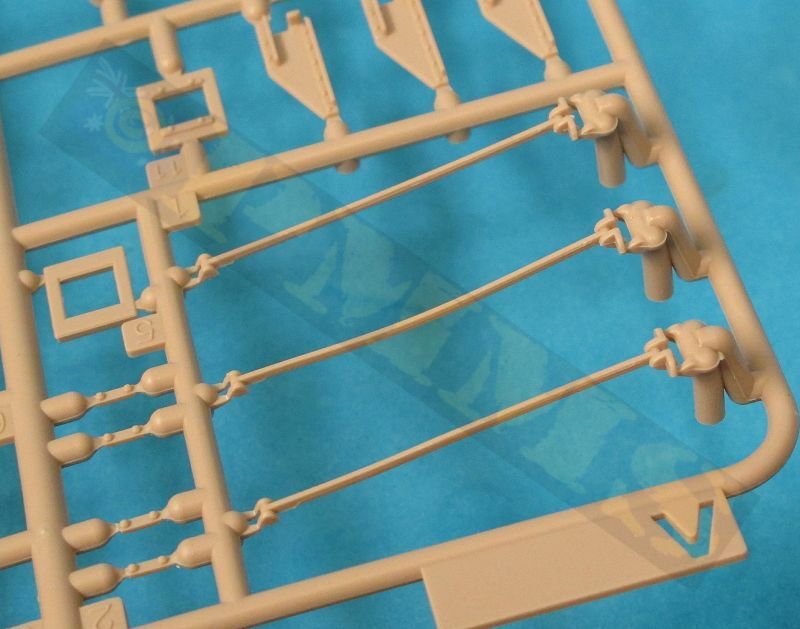 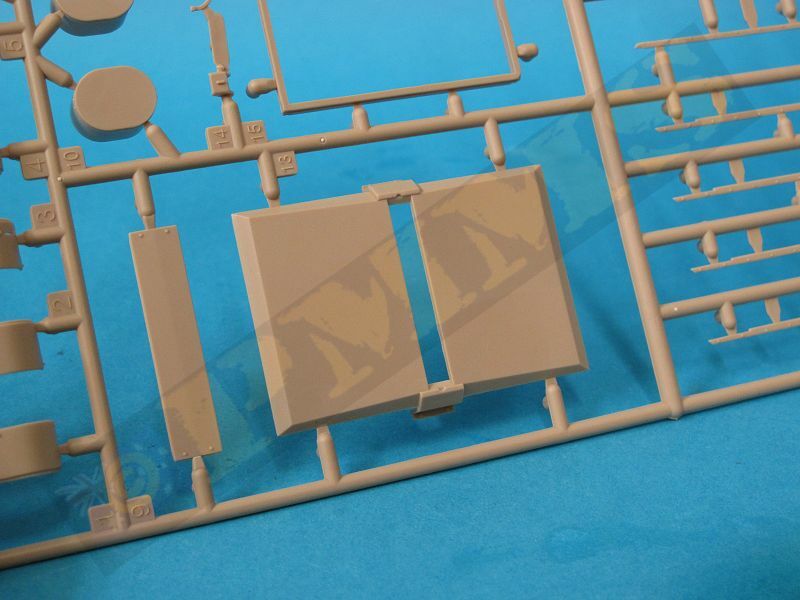 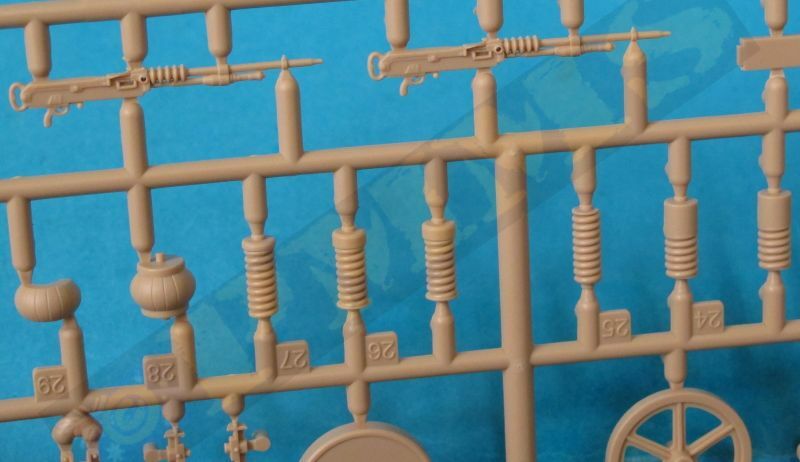 Other early types are seen with the narrower early track so you should take care if you wish to model a different tank than those included in the kit markings options. 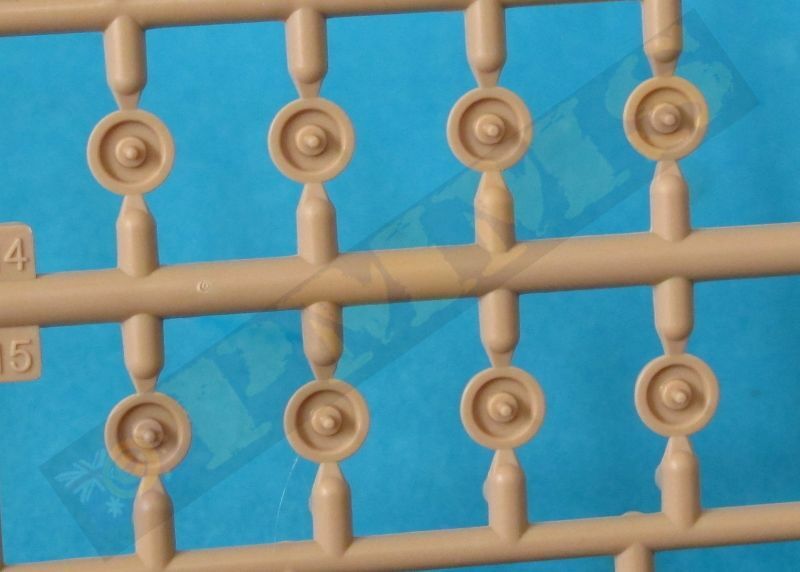 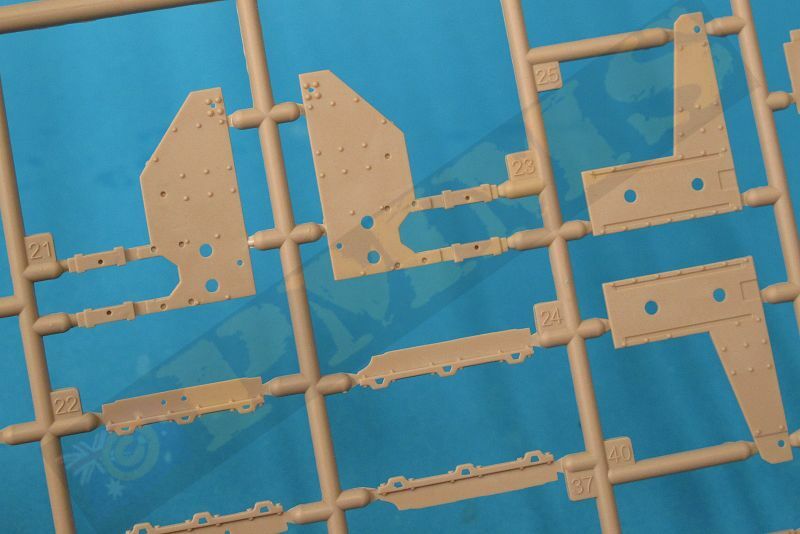 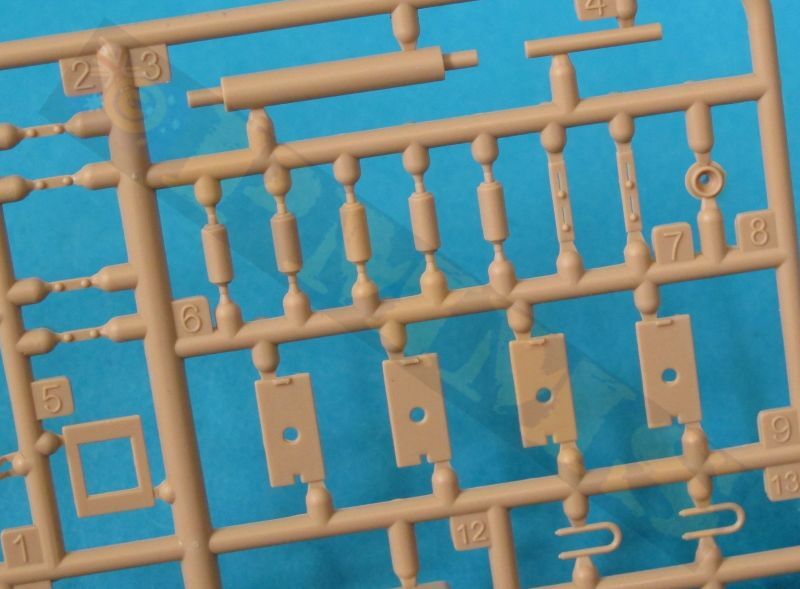 The standard of moulding is excellent with clean crisp details and virtually no visible pin marks of flash on the parts with just the usual fine mould lines to be removed as just a few of the additional plastic nodes on some parts. 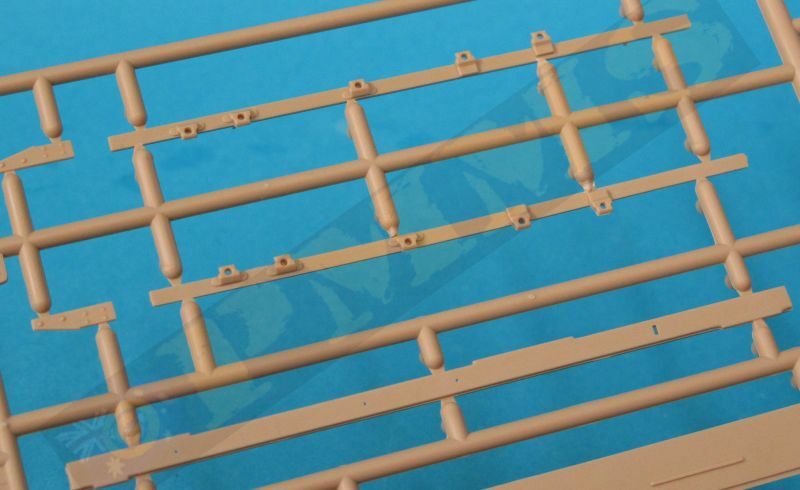 The hull rivet and panel detail is very well done with additional strips for the roof riveted strips to add additional detail definition. 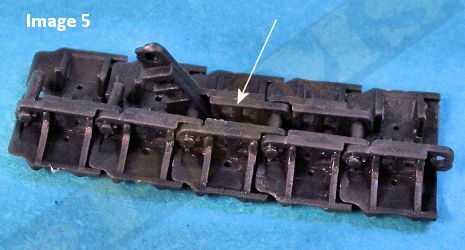 All the hull hatches are separate parts but there is no interior provided apart from the full 8mm Hotchkiss M1914 machine guns of which only the barrels can be seen after assembly. 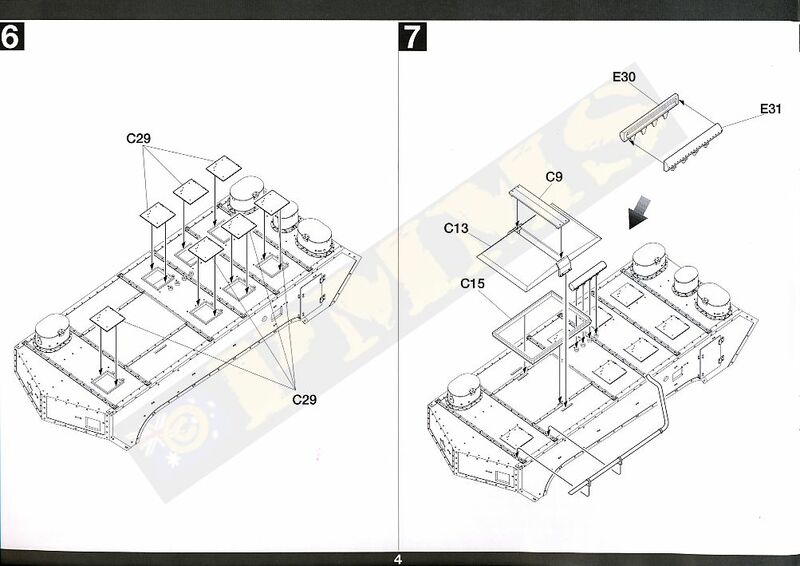 Dimensionally the kit measures out very well to available data although the only 1:35 plans I have are in the GUNpower 29 book listed below but quite frankly I wouldn’t be putting my house on these as there are some clearly evident errors. 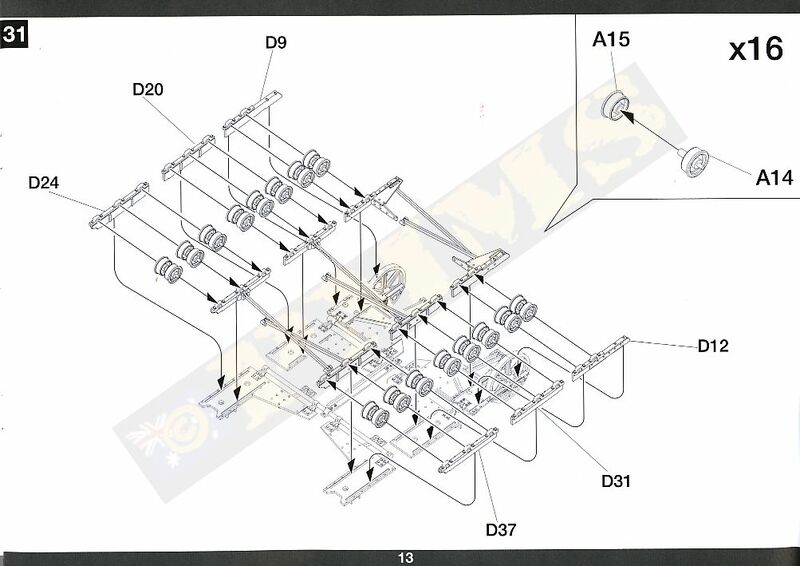 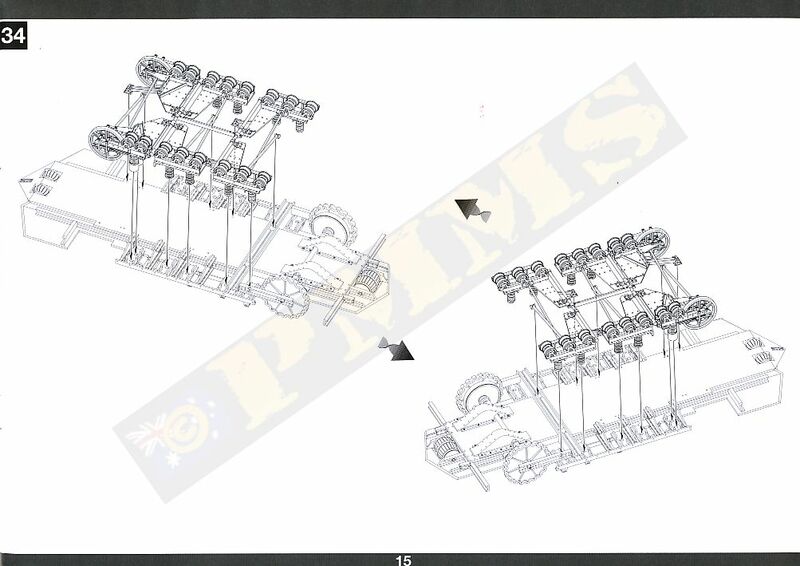 Especially with the suspension with the drive sprocket teeth depicted incorrectly and the idler wheels drawn about 2/3 the size they should be along with some other suspension components shown too small in the plans. 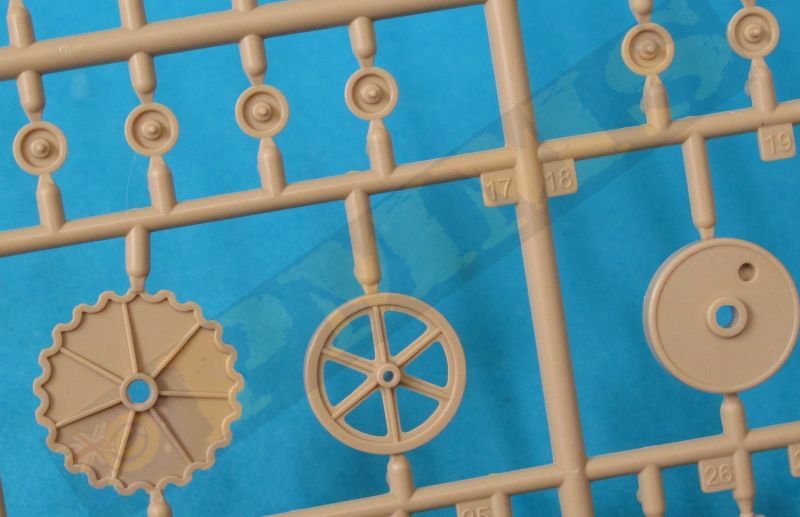 The kit drive sprocket, idlers and details match available photos perfectly so you should dismiss any concerns if comparing the book plans to the kit parts in that regard. 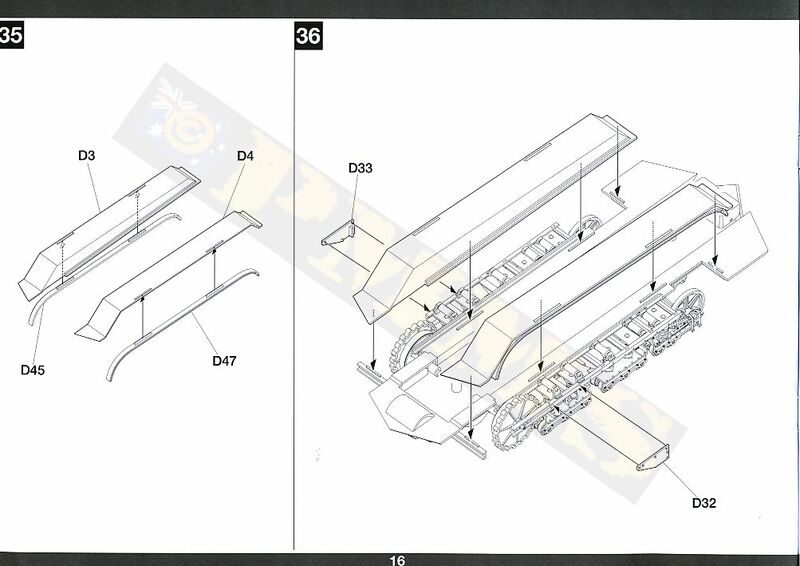 There is a discrepancy with the hull length between the kit and the GUNpower plans but given the known issues with the plans I’m not going to make a big deal of this as the other hull dimensions all match and the kit hull looks in proportion. 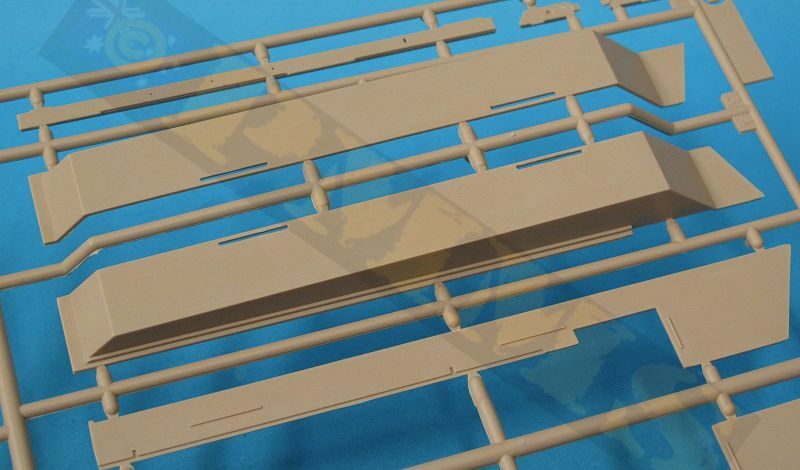 The main hull is a single large moulding with additional plates for the front and rear panels, these have bevelled edges for a perfectly flush join line. 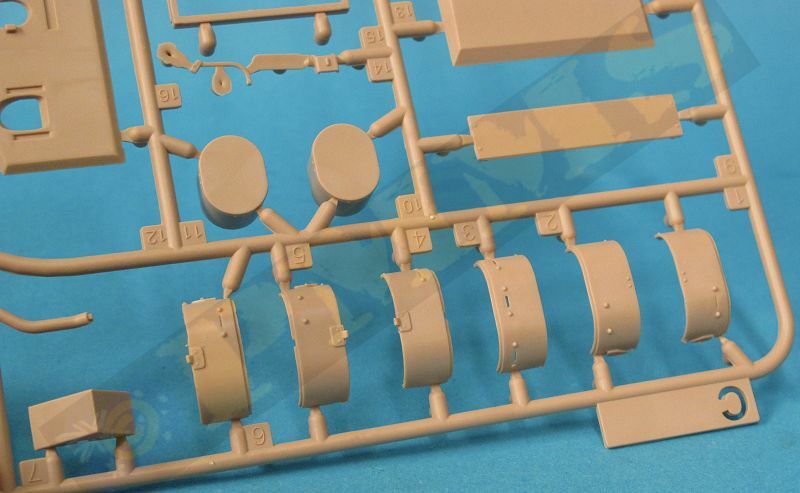 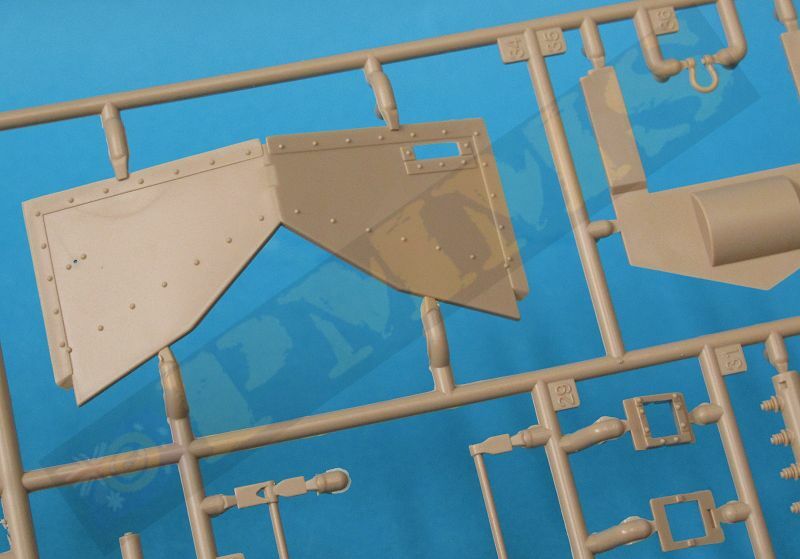 The only clean-up is the sprue segments inside the hatch openings and as mentioned the rivet and panels is very well done with other details such as the small top turrets and hatches, the exhaust pipe and muffler for fairly quick and easy assembly. 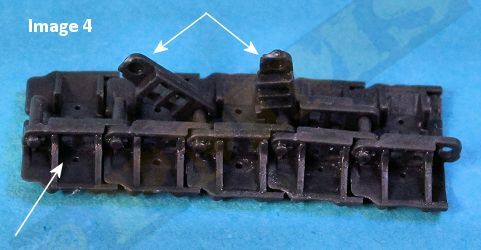 The four Hotchkiss MGs fit into swivel mounting added from inside the hull allowing the guns to move after assembly, the guns are nicely detailed but you may wish to drill out the muzzle for a better appearance although this is a very small hole in scale (about 0.2mm) so it’s up to you if you wish to do this? 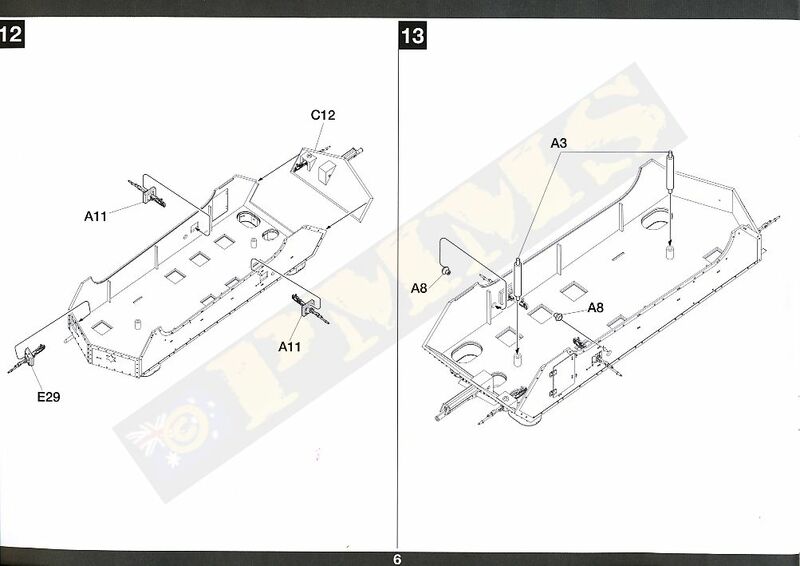 The separate front plate again has excellent rivet and panel details with the 75mm canon in two halves leaving the small join line to be eliminated and the gun will elevate slightly after assembly if you wish, as mentioned the front plate has a bevelled edge for a perfect flush join not requiring any filler. 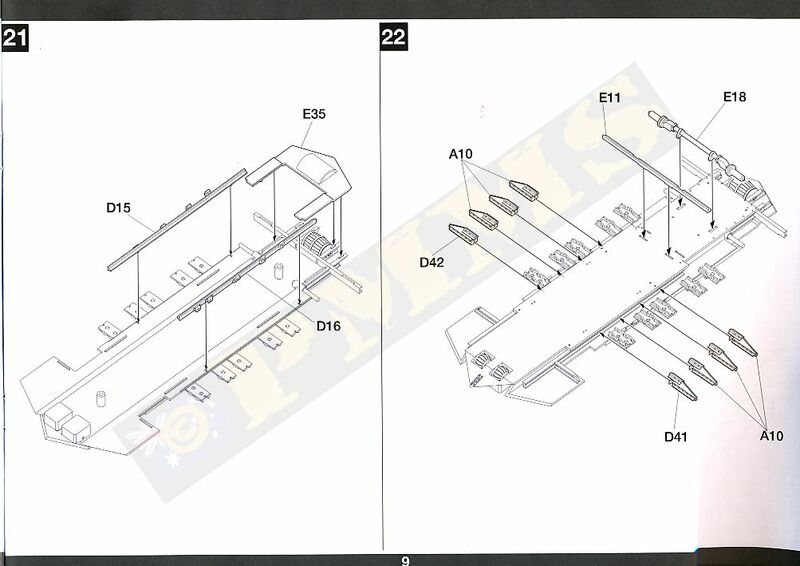 There is a separate hull floor plate to which is attached the suspension and lower hull plate fittings that takes up most of the parts and is extremely detailed with the multi-part lower hull mountings that include the final drives for the drive sprockets and the side bogie mountings. 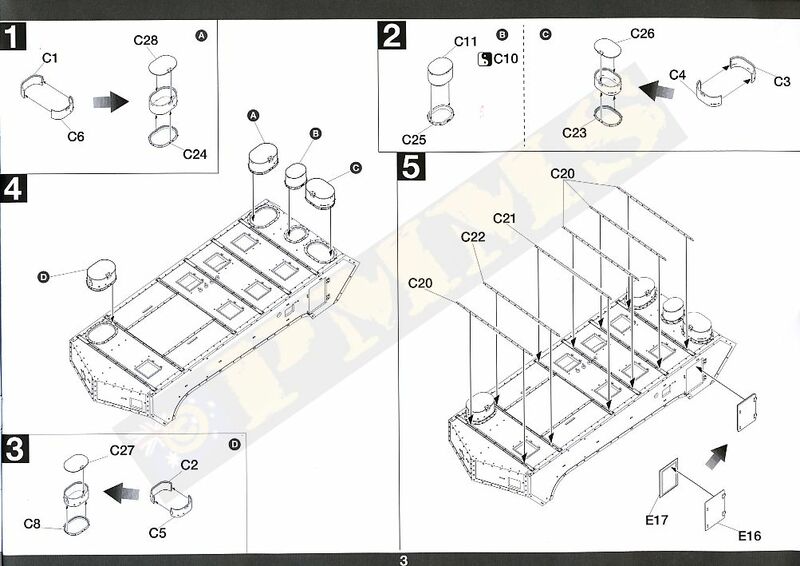 The instructions don’t mention but if you wish the drive sprockets to be movable you should not glue the sprockets (parts A16) to the inner drum (parts A18) but leave the sprockets loose and just trap them between the drum and the outer girder (part A30) when fitting to the axles. 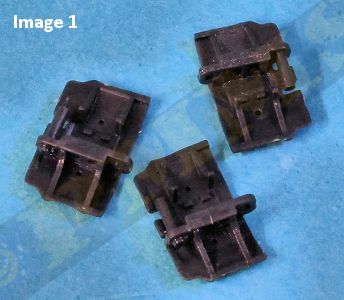 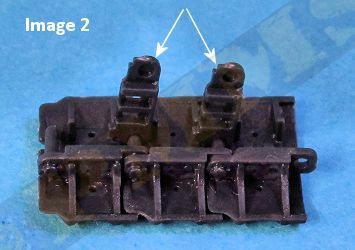 There are six separate under hull bolted panels for mounting the road wheel bogies and you need to take note of the part number to get the right location with the panels held together with a large connecting rod part. 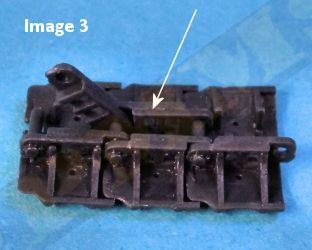 The bogie units themselves are further multi-part assemblies for the 16 small 2 part road wheels that are movable after being trapped between the road wheel mounting brackets, and added to the top side of the assembly are the 12 suspension springs, these are moulded solid in plastic and the spring gauge is scale accurate so should look okay when painted but of course these can be replaced with wire for more definition if you wish? 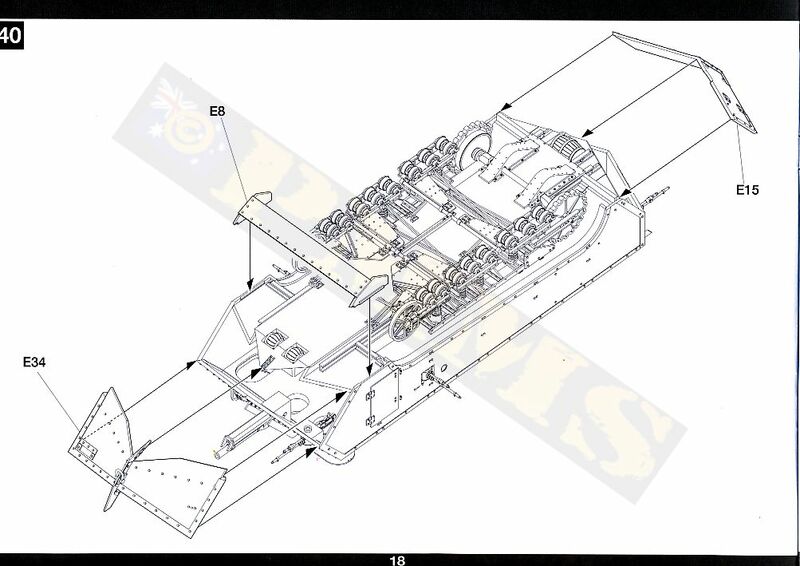 The fully assembled bogie units are then attached to the floor plate along with the large upper suspension covers with this in turn attached to the underside of the upper hull to form the completed hull. 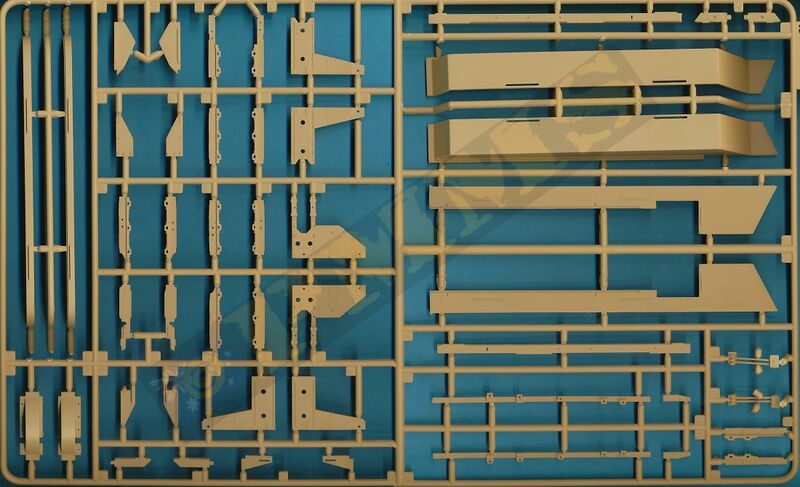 After fitting the lower floor the remaining front and rear panels can be attached and again test fitting these saw a perfect flush join due to the bevelled edges on the panels. 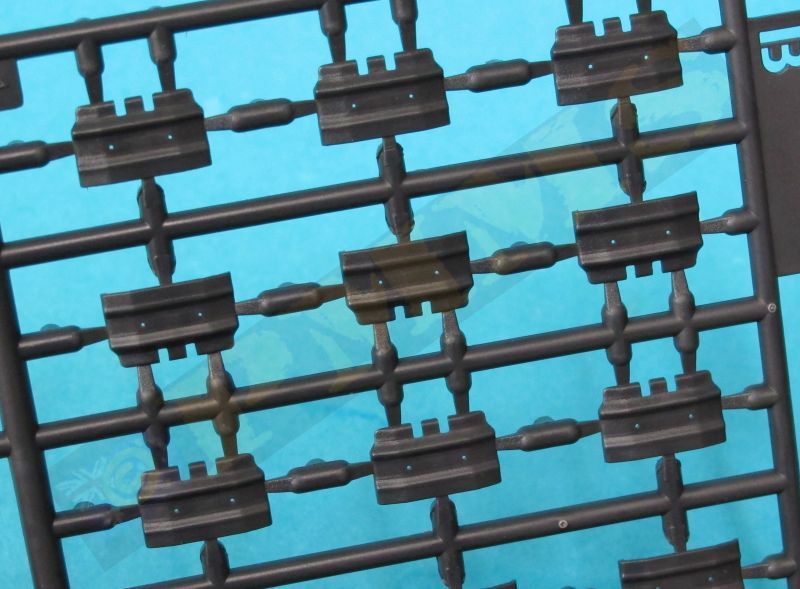 The tracks are the later 500m wide type individual link moulded in black plastic and these scale out exactly in size with just the sprue attachment burs to clean up before assembly, there are 5 points on each link and 2 on each brackets so a little clean-up time is needed but there are no pin marks on the links to worry about, well one on the inside face but this is hidden after assembly. 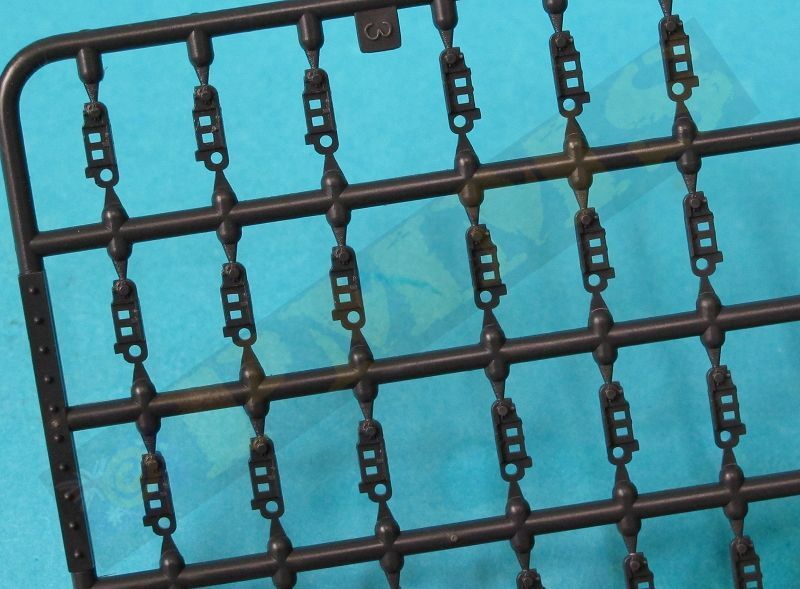 Detail on the links is nicely done with the track shoe profile and the two brackets having the open holes and nice bolt details, the links are designed to clip together with small pins on one bracket clipping into corresponding holes on the next. 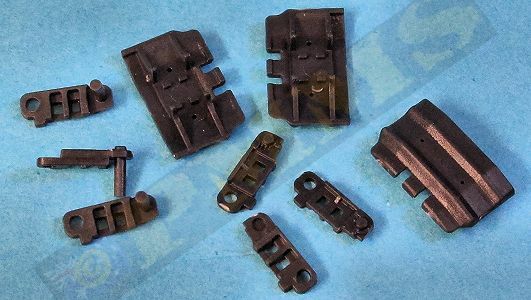 Assembly of the tracks is fairly straightforward providing you follow a set procedure, it easiest to firstly glue all the brackets with pins (parts B3) to the track shoes and let the glue dry before proceeding (image 1). 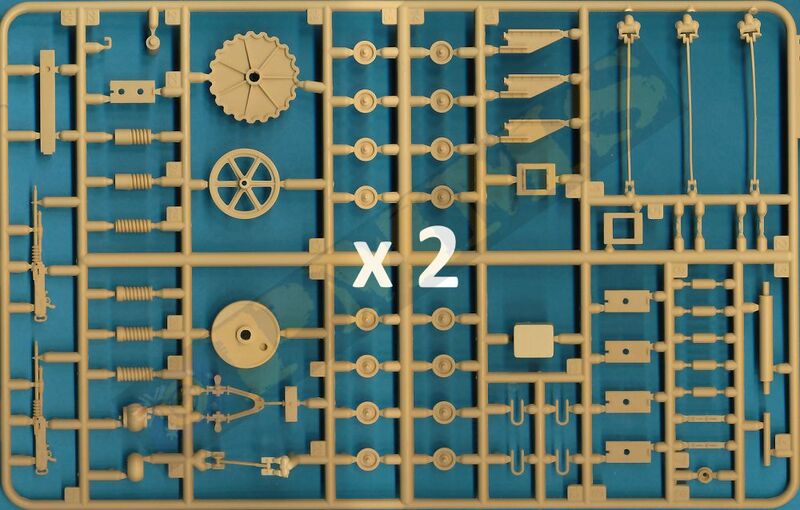 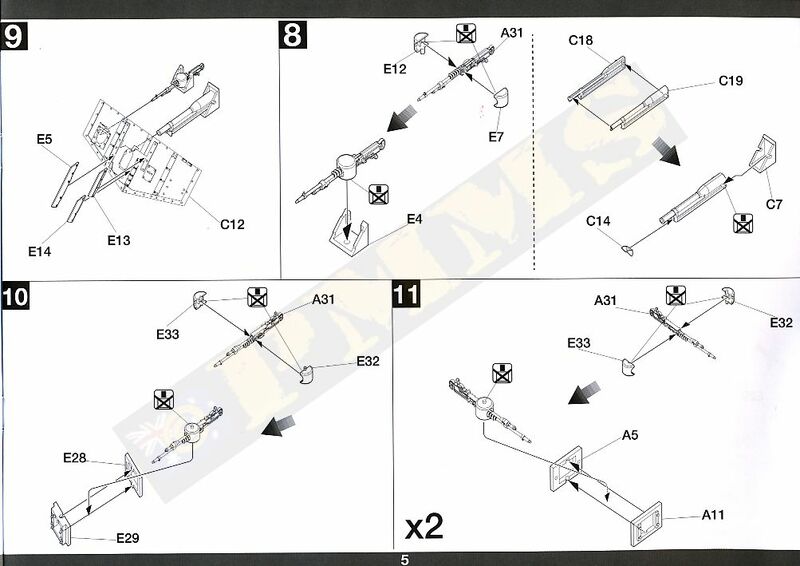 You next slip two more track shoes together in the pin bracket to have three links in the series (image 2), next slip two of the opposite brackets (parts B2) over the pins, you will need to hold the bracket at right angles for clearance to slip bracket B2 into place (image 3). 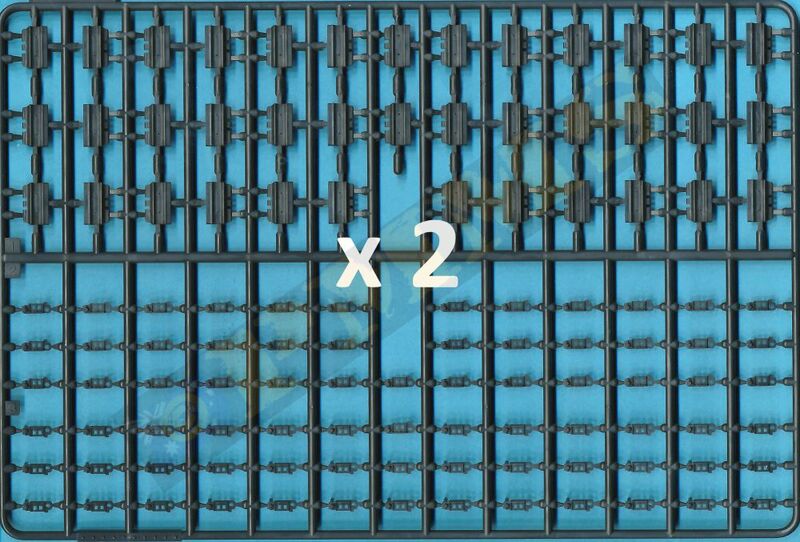 You then clip the first of the bracket B2 over the pin to secure the links while leaving the second of the brackets B2 loose at this stage. 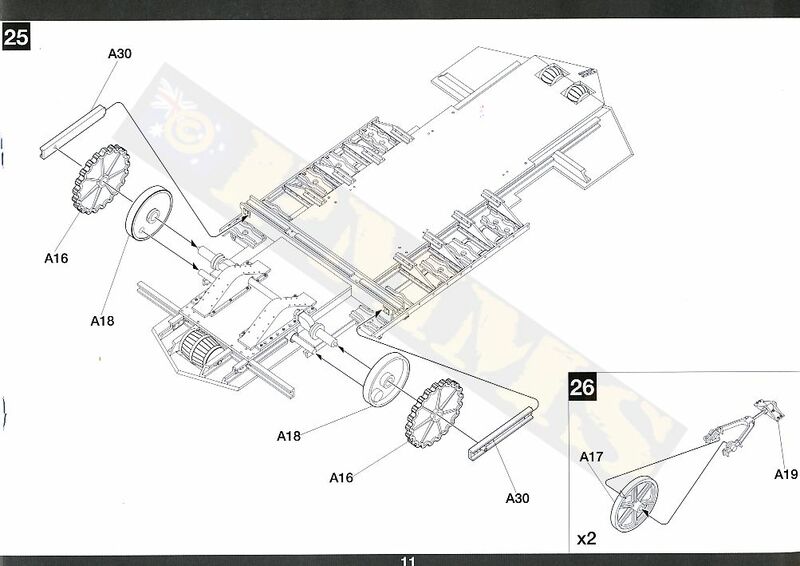 (image 4). 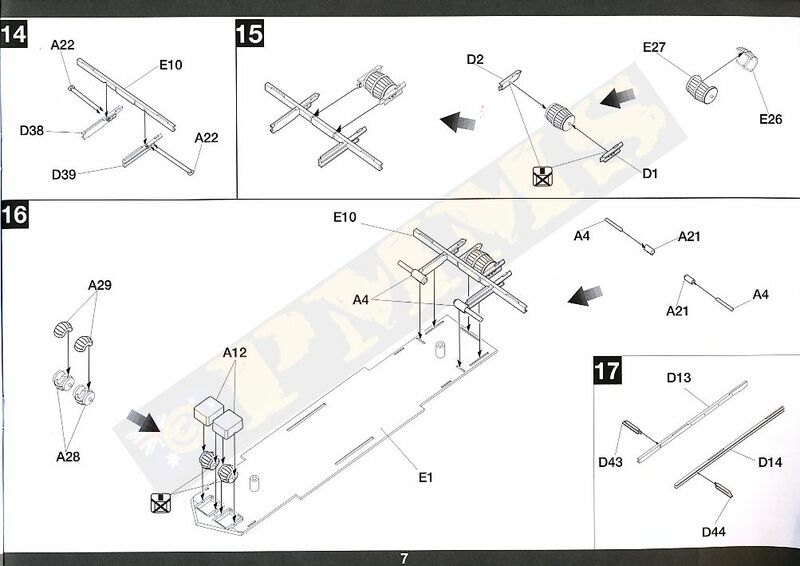 You then fit the next track shoe and bracket B2 over the precious link (image 5) and repeat step 4 for each subsequent link to assemble the 36 track links required for each track run. 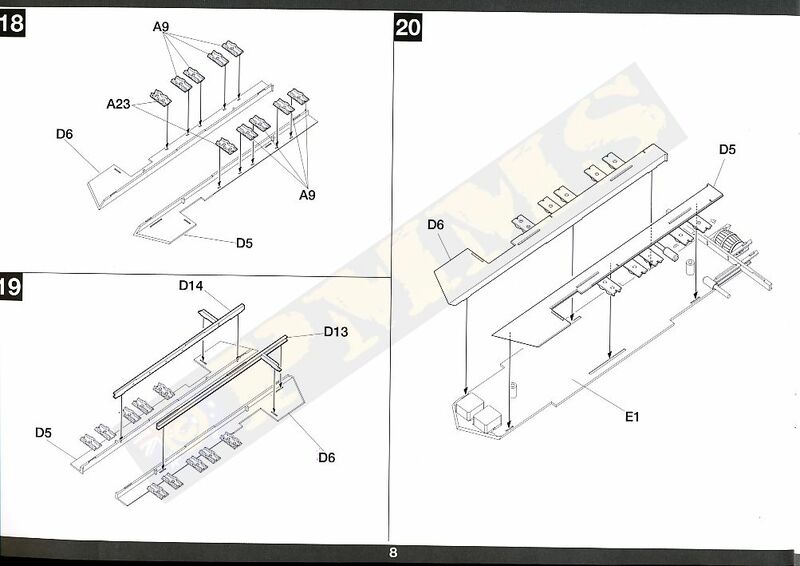 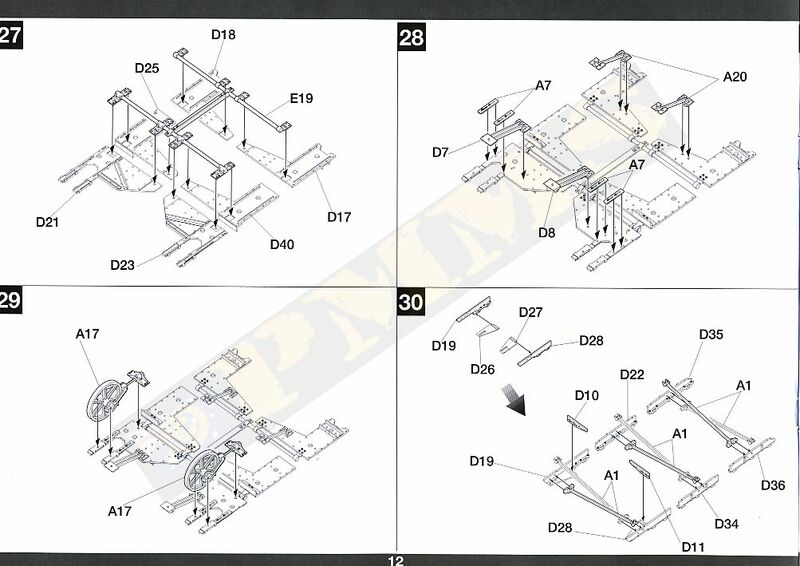 When joining the final links together around the suspension it’s easier to leave the track show off and just join the brackets (B2, B3) and fit the track show after as shown in the instruction as this give more working room to join the final brackets together. 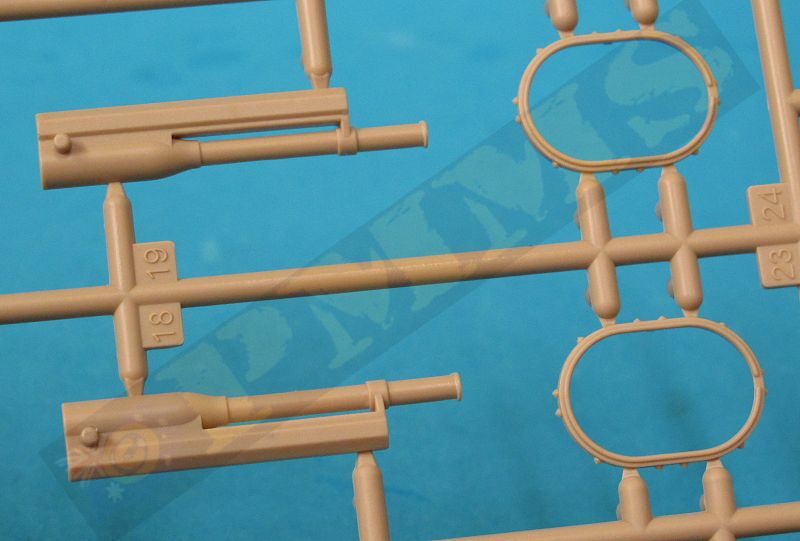 The assembled tracks articulate very well just like the real thing for good detail definition. 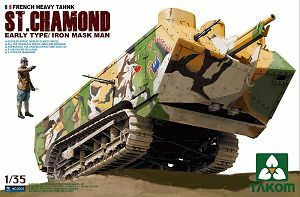 As a bonus you get a full standing tank crew figure wearing the standard French tankers uniform of WWI along with the metal mask worn for protection inside the vehicle. 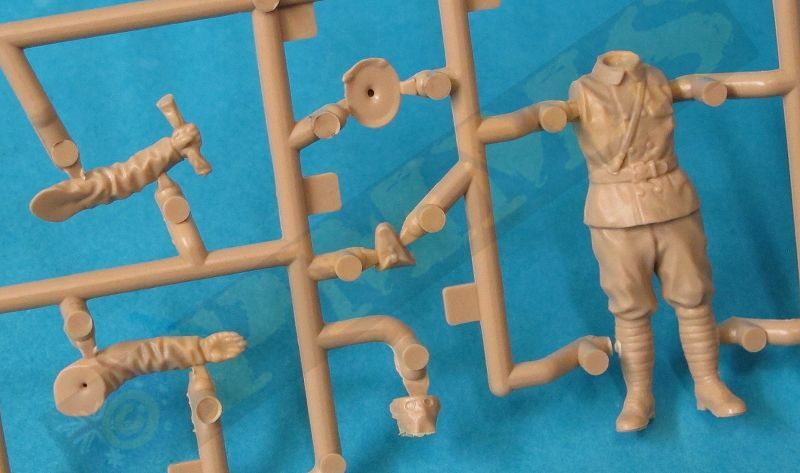 Detail on the uniform is nicely done with the figure broken down in the usual manner for plastic figures and has the obligatory pointing arm and will make a nice inclusion with the assembled tank. 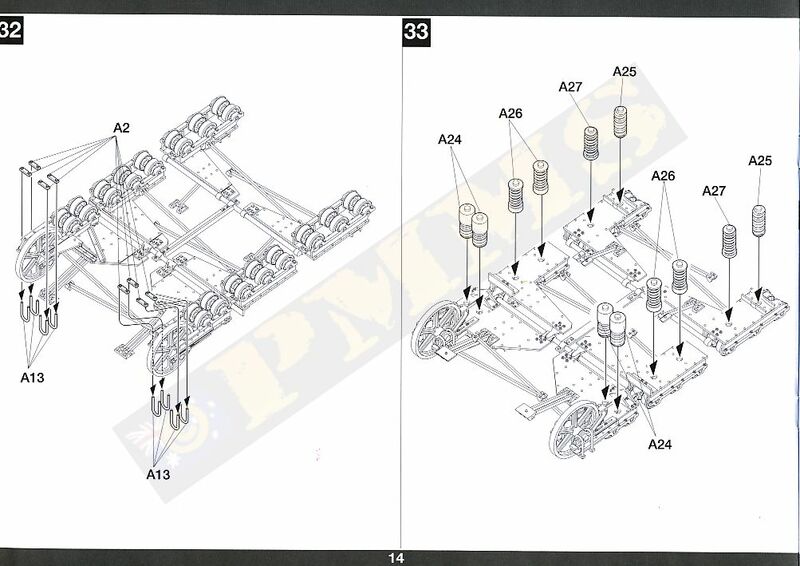 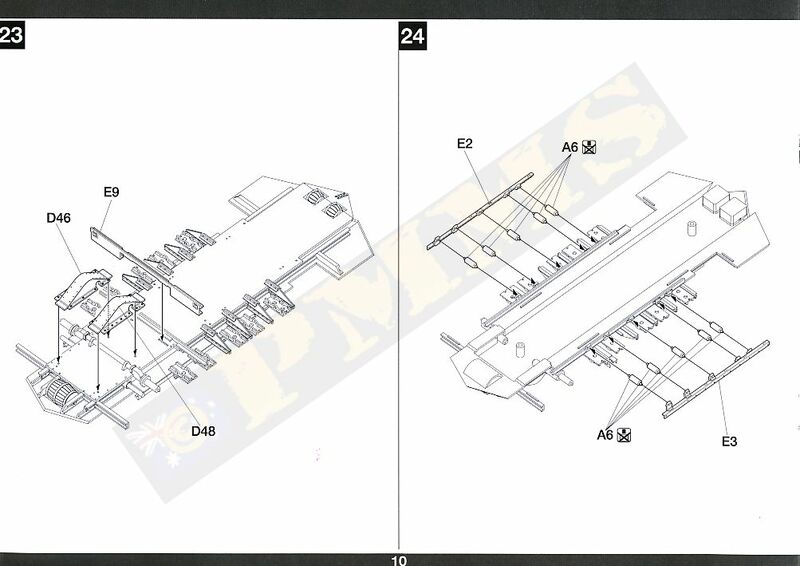 The B&W instructions are the usual exploded view line drawings that are well laid and easy to follow even with some of the more intricate suspension bogie assembly and there shouldn’t be any problems during constructions. 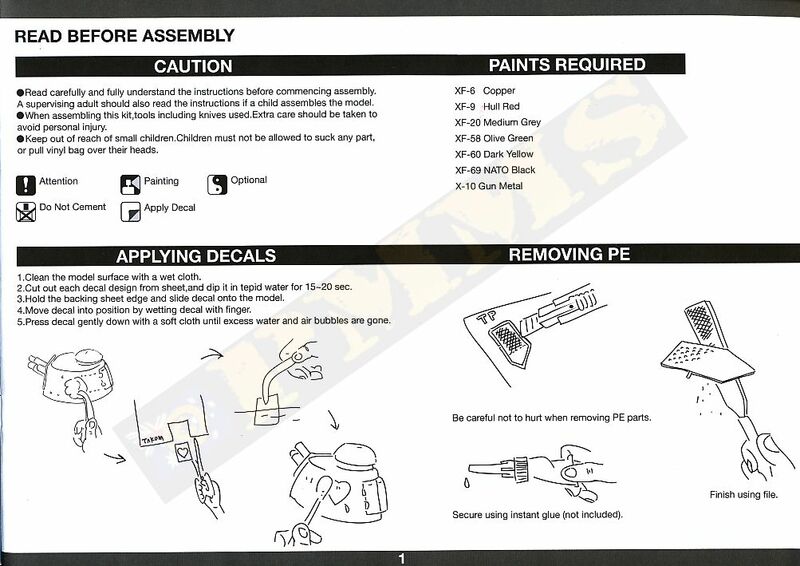 As usual the sequences should be studied before cutting or gluing to make sure all is okay. 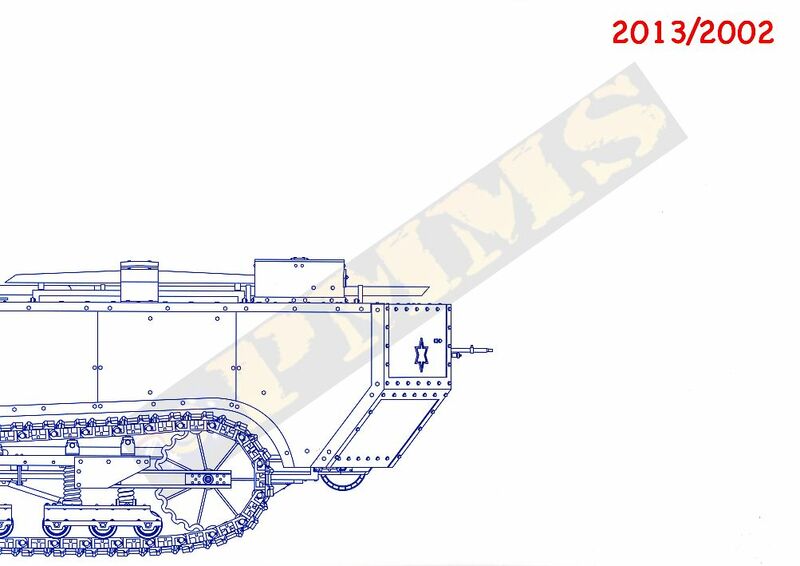 The small decal sheet has markings for two vehicles for the same unit As31 in 1917 with the sheet just having the vehicle names and serial numbers. 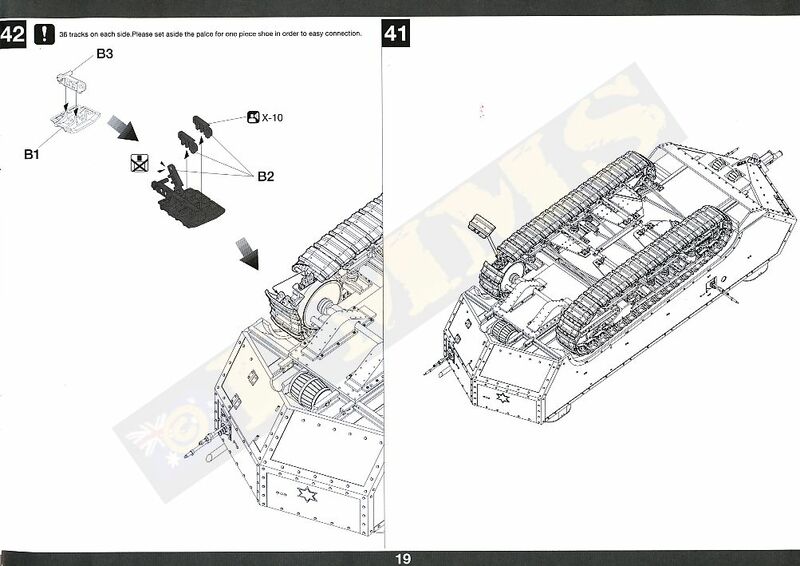 The complicated camouflage scheme is shown in 4 view B&W drawings in the instructions as well as colour side plan views on the side of the box. 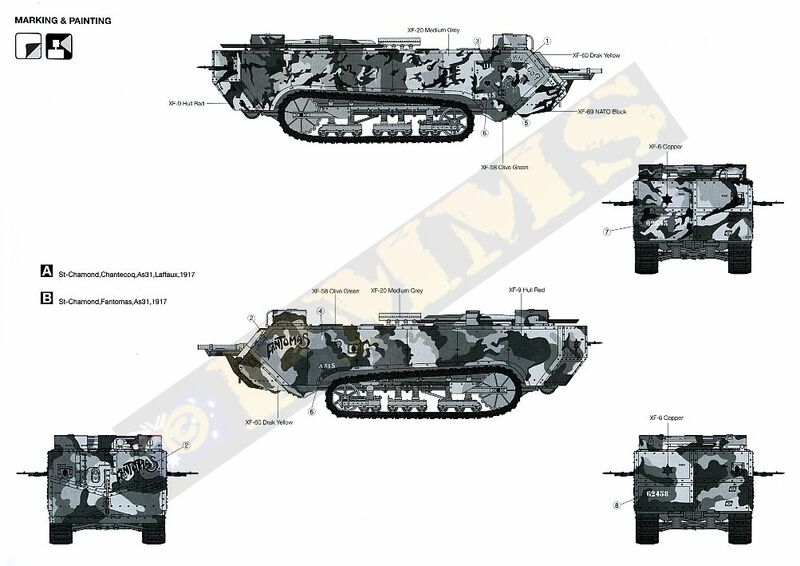 The camouflage schemes are based on that on the only surviving St.Chamond at Saumur in France. 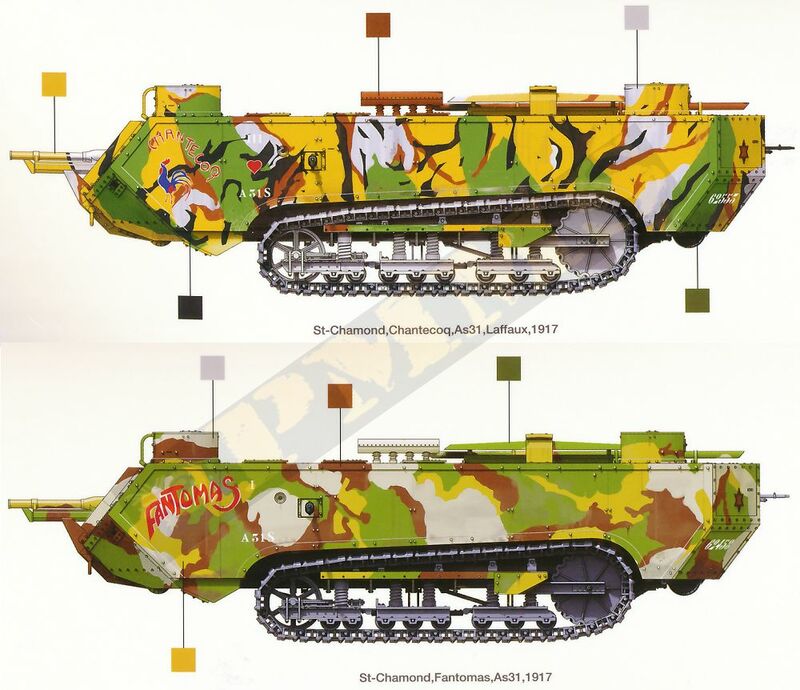 There is some discussion that the colours in the museum scheme are too bright and the actual colours were toned down somewhat, that will up to the individual modeller to determine I presume? 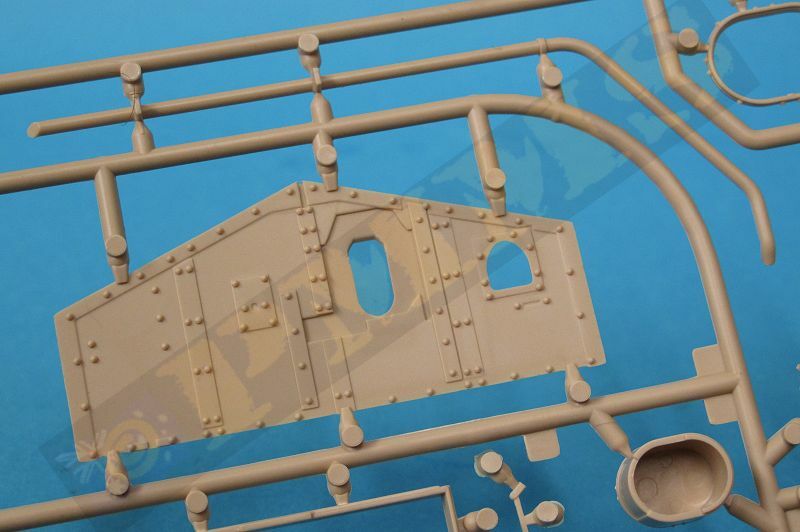 This new kit from Takom is an excellent rendition if the second production version of the St.Chamond which is dimensionally accurate overall and with a high standard of moulding and detail definition along with good fit of the parts test fitted for this review. 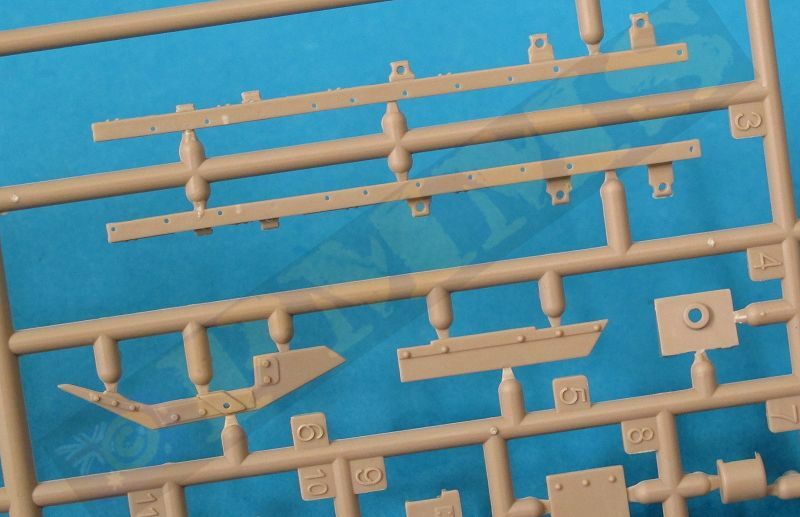 The rivet and panel detail on the large box hull is especially well done and along with the nicely detailed suspension will result in an excellent looking model that is quite large in overall size although the camouflage scheme will exercise your painting skills somewhat. 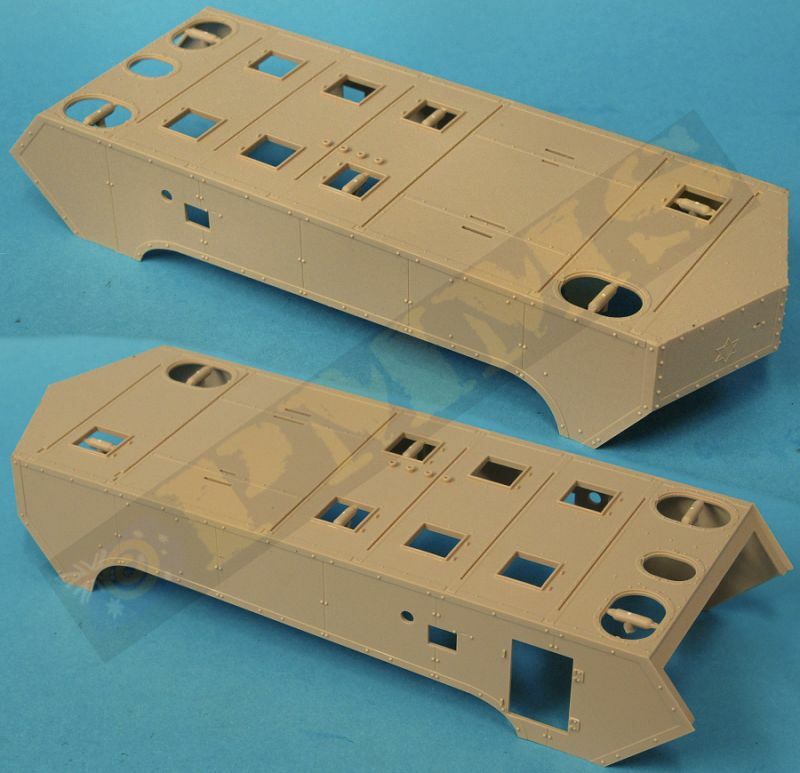 As noted above the kit is the second production version but has the later 500mm wide tracks and while period photos show this is correct for the two marking options in the kit you should take care if building other vehicles as they may well have the earlier narrower track types. 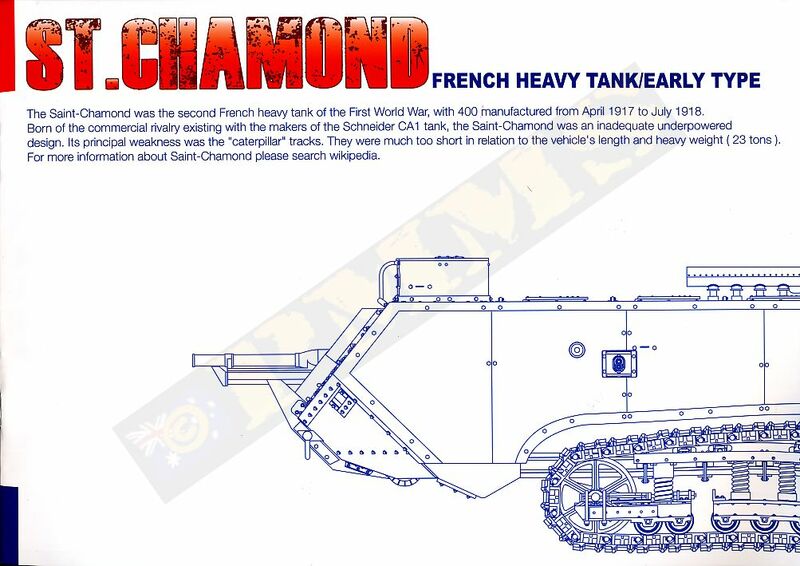 This site has lots of period St.Chamond photos that could be of assistance? 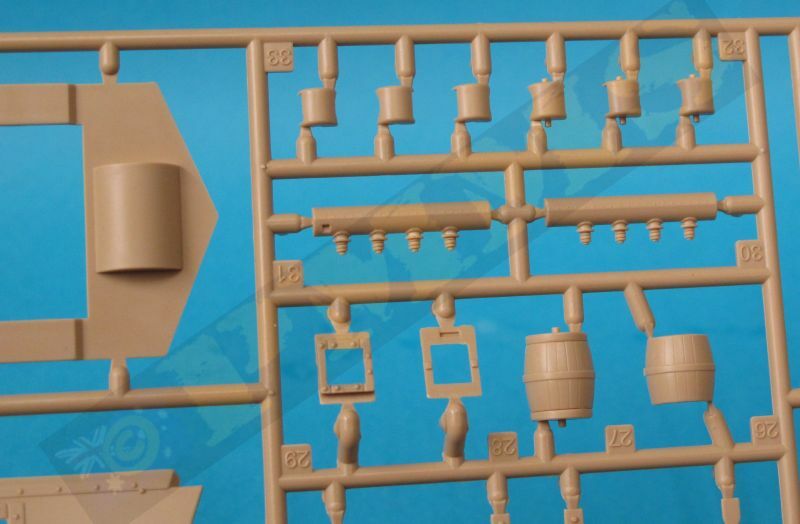 The added bonus figure is a nice touch and the kit should be welcomed by armour modellers in general as well as WWI fans and will add to the growing list of WWI kits making an appearance in time for the 100th anniversary of the start of the ‘War to End all Wars’ next year.